In this post I want to share about the advantages of joining a fanclub. As seen in this blog, I join 2 fanclubs. The Changcuters and SHINee World. I love to listen to their songs to relieve my mind at first. As both of these teams are talented, funny, and can entertain people. The story began when I was a junior high school student. That time I was captivated by The Changcuters humoris side and also enjoyed their music. Someone said "what's the use of being a fan? You cant even meet them or they dont even know you exist. If you can meet them then I wont say anything"
I was an introvert. Not the one who always want to be alone, I just dont know how to start a conversation. Those words were so hard to do but I put it aside and tried to get closer to their staff and fans. By doing this, it really improves my social life a lot. And I also gained many friends. The staff were also kind to me as I sometimes helped them when they held a concert in my city. They also helped me to get into venue with so many privilege and i got to meet The Changcuters few times. They even gave me some merchandise and send me a drum stick on a package. 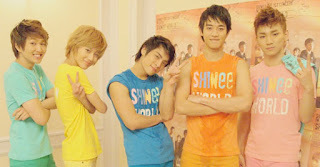 As for SHINee, I acknowledge that I wont be able to meet them in person. It's enough for me. Being in the SHINee World makes me happy. There are many good advantages by joining this family. I got to know many friends around the world. I also improve and practice my english as I usually talk to them in english. They are so supportive and most of us always prioritize our study so dont worry, they wont drag you to become lazy. My friends comes from different fields of study, sometimes I reach them just to ask about problems in different fields like economic, medical, food, or even arts. This also motivates me to save my money. I never asked my parents for this fangirling life. I bought the albums, merchandise, and concert tickets by my own money. I don't want to be a burden. But well..... Most of the times i use these money for something that are more important than buying those stuffs  again, priority! Another advantages is having a friend in each city or country  It helps me when traveling. I always reach out to them whenever I come to a specific city/country. I also do the same when they visit my city. My friends visited me when I went to Bogor (pssst they dont even live in Bogor but they came to the city just to see me and drop tons of food  love them!). It also happens when I planned to visit Singapore. A Shawol offered to guide me there. I love this family! I strongly disagree with this! As i already proof it. I have a good bond with my internet friends. Still, you need to be careful on choosing your friend. 1. Keep sane! There is a line in everything. Don't cross the line! 2. Make it a motivation. If it worsen your personality and education, then leave! 3. Parents permission is always needed! 4. Education is the priority! Super Junior Sleeping Habits by Siwon"Leeteuk -> he curls up and wraps himself up in his blanket, he sleeps with his face againts the wall, he looks like he's sick"
Satu kata ini yang tak henti-hentinya kuucapkan hari ini. "Allah will make a way when it seems like there is no way"
It is a good phrase to tell my condition today. 2 months ago I applied for a scholarship program and found out that I didnt make it 3 weeks ago. Accepting that it might be what Allah has written for me, I moved on. I was praying so hard for something that I really want and thought that this is the best for my future. I prayed hopelessly. I believe that this is the best for me. Until one day I realise, Allah know what's the best for me. I change the way I think. I pray for the best. I surrender to what Allah has written for me.Then a good news come. It's not the thing that i pray hopelessly. It's even better than that.